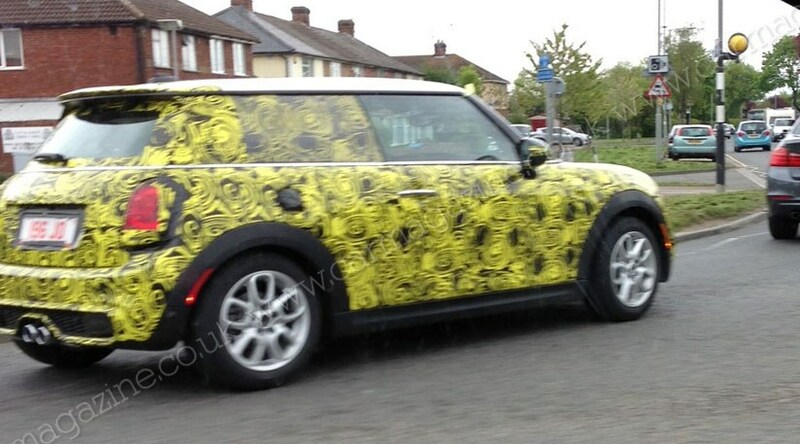 The new BMW Mini is almost ready, as we can see in these spy shots sent in by CAR reader Marc G. S. Chapman. Marc spied this disguised Mini Cooper S in a four-car-convoy in Buckinghamshire, undergoing final UK set-up testing ahead of an expected debut at the Frankfurt motor show in September 2013. What’s new for the next Mini? Different bodystyles – there’ll be three-and five-door version of the Mini hatchback, which will grow slightly in overall dimensions to offer better cabin space. The longer front overhang and taller bonnet will improve the new Mini’s pedestrian crash protection. Simplified cabin – out goes the central speedometer, and in comes a more recognisable BMW set-up: a rev-counter and speedometer behind the steering wheel. Toggle switches and a vertical centre console remain, but quality will be taken up a notch from the creaky outgoing Mini. Shared BMW bits – under the skin the new Mini shares its front-wheel drive architecture with the next-gen BMW 1-series, which will also switch to front-drive. Another BMW carryover is the inclusion of the iDrive infotainment system: click here for CAR’s full Mini iDrive scoop. What powers the new range of Minis? The Cooper S (given away in these shots by the rear spoiler, covered bonnet scoop, dual exhausts and sporty alloys) should get a turbocharged four-cylinder engine with around 200bhp. Entry-level Minis will switch to turbocharged three-pot power (ditching the normally aspirated 1.6s) to improve fuel economy test results.